The annual deficit has fallen 32% over the first seven months of this fiscal year compared with same period last year, according to Congressional Budget Office figures released Tuesday. A major reason: A big jump in tax revenue. Tax collections rose by $220 billion -- or 16% -- between the start of the fiscal year on Oct. 1 through April 30. Individual and payroll taxes accounted for $184 billion of that increase. The tax haul rose sharply primarily because wages and salaries were higher, the payroll tax cut of the past two years expired on Jan. 1 and the fiscal cliff deal brokered over New Year's raised tax rates on high earners. 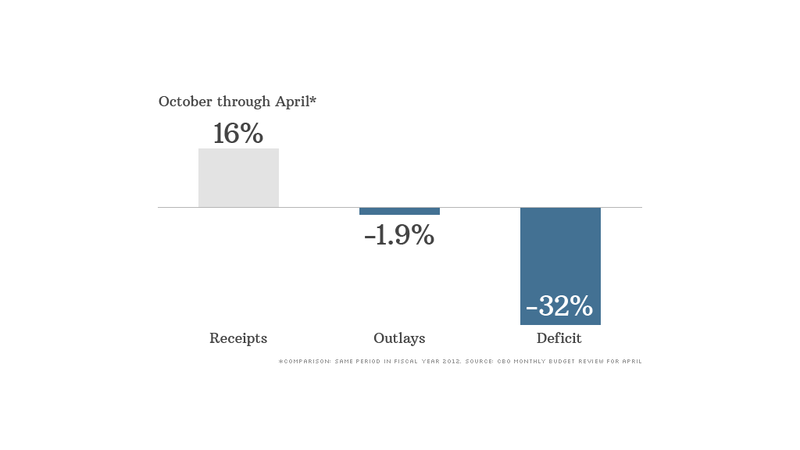 Spending, meanwhile, fell 1.9% year over year, the CBO estimated. The biggest percentage drop occurred in the payment of unemployment benefits, which were down nearly 25%, or $15 billion. Defense spending fell 5.3%, or $20 billion, and "other activities" -- primarily spending on nondefense programs -- fell 8.6%, or $58 billion. Less was spent, for instance, on housing assistance, energy programs and international assistance, along with the TARP bank bailout and on mortgage giants Fannie Mae and Freddie Mac. Spending in some categories, however, was higher. Medicare, Medicaid and Social Security outlays combined rose by $50 billion, or between 6% and 7%. While the country has still racked up an estimated $489 billion deficit in the first seven months of this year, that's about a third less than the $720 billion recorded for the same period last year. Higher than expected revenue and lower spending has pushed back the real deadline for when Congress must raise the debt ceiling until as late as October. And it's easing pressure on Congress to cut a big debt deal anytime soon. Later this month, the CBO is expected to publish its revised estimates for spending, taxes and deficits over the next 10 years. Earlier this year, it estimated an annual deficit for 2013 of $845 billion, but some budget observers have said they expect the deficit for this year will come in lower than that.